Great Lakes Council’s contractor, Civibuild Pty Ltd has completed works to replace Gortons Crossing Bridge over the Karuah River to the west of Stroud. “A new concrete bridge has been built to replace the old timber structure that was washed away by flooding in early 2013” said Council’s Director of Engineering Services, Mr Ron Hartley. The new bridge has been built at a higher level than the old structure to reduce the incidence of flooding. The single lane bridge has been designed for a 100 year design life. “Maintenance requirements on the new concrete bridge will be significantly less than the cost to maintain the old timber structure” said Mr Hartley. “Council staff has completed work on the road approaches to the new structure and the bridge is now open” said Mr Fish. “Natural Disaster relief funding to replace Gortons Crossing bridge has meant that Council has not been left with the financial burden of replacing the bridge following the flooding” said Mr Hartley. 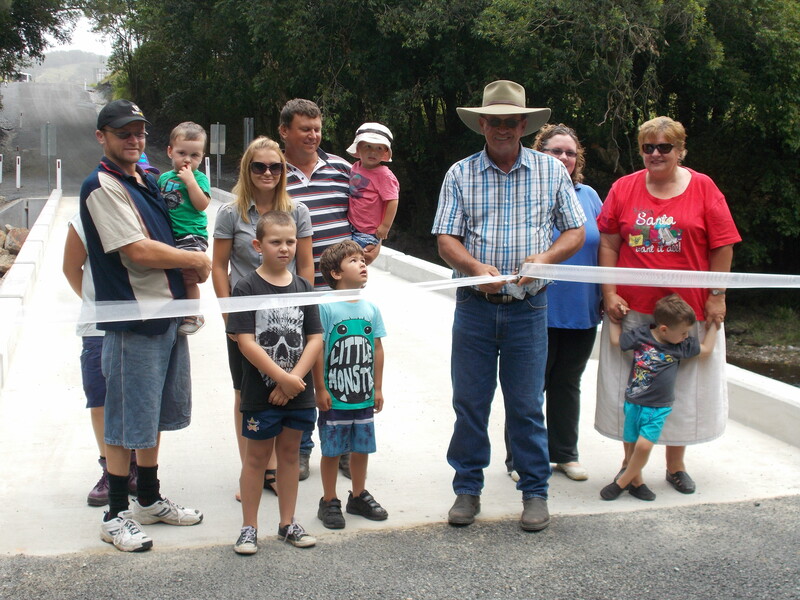 Members of the Gorton family gathered on Wednesday 17 December to officially open the new Gortons Crossing bridge. Pictured (L to R) are Matt Gorton, his wife Lee (hiding behind Matt), Tania Gorton, David Gorton, David Gorton (senior), daughter Katie and David’s wife Pauline Gorton, together with grandchildren.